Marvel makes good on its promise to start killing off the Inhumans, starting with three members of the Royal Family. Once upon a time, Marvel envisioned the Inhumans as the next big group of mutated individuals. The comics saw a wave of NuHumans arrive thanks to a Terrigen Bomb, Agents of S.H.I.E.L.D. 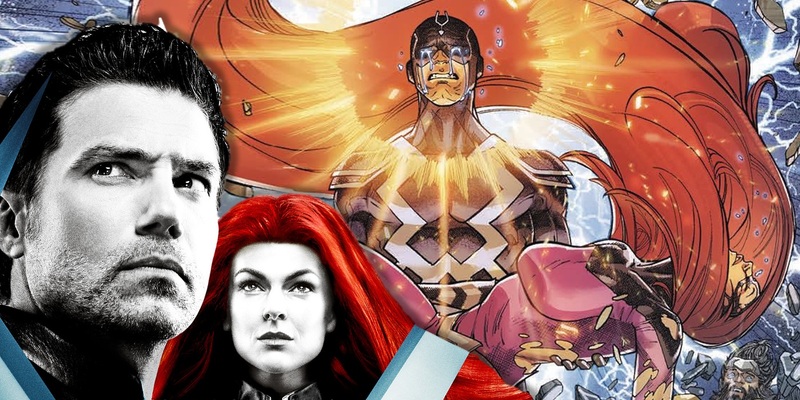 built many of its seasons around the idea after introducing Inhumans to the MCU, and Phase 3 was meant to end with a film focusing on the Royal Family. But after a move to TV, the show gave the MCU their first real flop and ABC officially cancelled Inhumans earlier this year. On the comic side, the characters are still going strong, though titles bearing their name have dramatically decreased in the past few years. In March, Marvel announced Death of the Inhumans, teasing the possibility that the Royal Family might be wiped out and only a handful of characters would survive. And while comics rarely let a death stick for long, the first issue of the new series is at least living up to its name. Death of the Inhumans by Donny Cates and Ariel Olivetti kicks off recapping the past few years of the Inhumans in the comics. Essentially, the Kree experimented on various races then abandoned them upon learning of a prophecy that Black Bolt would wipe them out. Now, with their world engulfed in war, the Kree are killing off the Inhumans. The queens of the four other intergalactic tribes are all swiftly eliminated, undoing much of the set-up for the recent comics. And when the Royal Family goes to investigate, a bomb kills Triton. But that's just the beginning. We meet a new "super-Inhuman" named Vox, who looks like an evil Black Bolt. He not only possesses a hi-tech scythe, but the vocal powers of his lookalike. Landing in the current home of the Inhumans, he begins killing characters, with NuHuman Flagman the only visible casualty. But when Lockjaw brings the other royals to Maximus' aide, we witness the lovable dog and Black Bolt's unhinged brother pay the ultimate price. While Marvel has done a few Death of... events in the past that are ultimately reversed (see the current resurrection of Wolverine), the Inhumans are in a tricky spot. Their show failed, there's no sign they'll appear in the movies, and Marvel's push to make them bigger in the comics hasn't exactly mirrored the success of the X-Men. And speaking of the mutants, the impending Disney/Fox deal means they could soon join the MCU along with the Fantastic Four. Marvel is hyping the return of the Fantastic Four in some big ways, and the X-Men have never gone anywhere in the comics. So there's a chance Marvel are cutting down the Inhumans in order to further push the First Family and mutants as they prepare to bring them to the big screen. Then again, it's hard to imagine the lovable Lockjaw truly being gone from the comics, so we could still find all of this as a ploy to cut out some NuHumans and bring some attention back to the Royal Family. After all, Saladin Ahmed and Christian Ward's recent Black Bolt series was one of Marvel's most critically acclaimed. In the end, it's unlikely the Inhumans will suffer a major set back, but fans could be saying a permanent goodbye to some characters. Death of the Inhumans #1 is available now from Marvel and comic book retailers.